This amazing selection of tasty treats features a deluxe, heavy duty ceramic, Christmas platter pilled high with a delicious assortment scrumptious sweets! Who could ask for anything more? Just imagine this beautiful gift full of goodies sitting center stage at their office gathering or in the middle of the celebration on Christmas morning! As an added bonus, this gift even includes a gift box of three gingerbread scented, gingerbread candles. They will love this gift filled with high-end goodies! 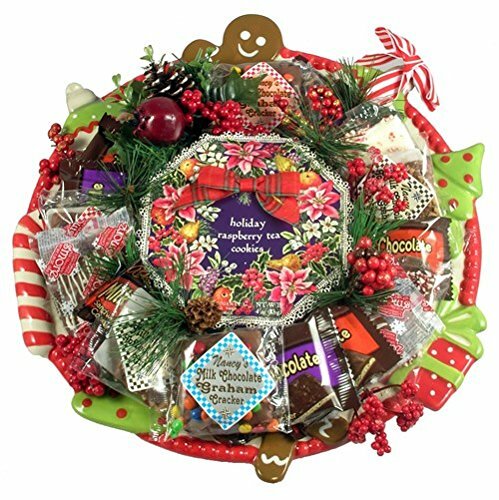 Send Christmas cookies on a unique ceramic Christmas cookie platter and your gift will be remembered every year when they bring out the beautiful holiday cookie platter. The festive holiday cookie platter is made of heavy duty ceramic by Mud Pie and features hand painted raised graphics and measures 16 inches in diameter.